Newsletter editor Trevor Bond reflects on a great day. A great day. Where do you begin to spell it all out when trying to describe our success with the Soapbox Derby. Anticipation......................Nervous, exciting, lost sleep, tension. A day which dawned with grey skies and mounting concern ended in what can be called only glorious technicolour. (Even the sun shone on us briefly) - a triumph of mind and matter coming together to make it what it was always hoped to be: Spectacular! Above all a challenge made, and a challenge met. There will be a time to count the cost but, for just this moment, ...... let’s celebrate. Committee,organisers and many more are mentioned in many despatches. And the community, the people turned up, hour after hour to enjoy the event and make us realise just how right we got it. District Governor, Alan Clark, stayed all day to act as judge and jury, helped by our patron Lord Petre, and decide the winners. What winners they were, from schools like Quilters Juniors and Shenfield High to those corporate companies and kart-raved individuals whose hard work and effort all came together. They all went down the jump and raced under the brilliant commentary by Ken Smith and the flag-waving starting and mastering of the racers by James Ilesley and Malcolm Acors. I worked on two gates with members from Rotary Club of Billericay Mayflower, and with Round Table who have 46 years’ experience of their annual Fireworks Night to make everything work simply and smoothly. Scanner is an ugly word for me, for them…. Simples! Gate Leader Seb said: “Leave it to us - we know the ropes... we are delighted to be involved. Fast-tracking has made our job much easier - great thinking on your part.” That, when the two of us were even out in London Road urging spectators, as they spilt over in their hundreds. we urged them to filter to pre-paid and cash purchasers, right or left to make entry easier. Much the same as on all the gates. And with our Mayflower colleagues: Chatted well with their man Barry Howe at the last knockings (What’s the time, Trevor – is it 3.30 yet? - “Gates Open”.) Even at 3.20 people were still pouring in for as last look. Down on the Family and Fun area, kids, having goggled at the karts, picked out their favourites and then persuaded mum and dad to let them free to enjoy the bouncy castle and the other fun areas, were in their element. As one family told me: “We did not expect all this. We came for the racing but cannot believe how much fun there is for everyone.” And that after they had stood in line patiently to buy the hot dogs, bacon rolls, fish and chips and been to our own club beer tent to ensure that they were all well fed and watered before carrying on enjoying the day. When the toilets were running out of loo rolls, Bert French and Grace were despatched to Waitrose to buy more and yours truly delivered four bags full to hand out to those waiting with legs crossed to find relief. Suffice to say, I know my place when duty calls. But it was a long trek to deliver. Something to think about. Mine was a minor role on the day. I like to think I had done my hard work in promoting and publishing the event. But, on Monday, it was impossible not to get caught up in the atmosphere – to be told: “Gate so-and-so needs help” So off you went to assist. Or just be there in case someone came up to you and asked: “Tell me more about Rotary.” And many did. Winners, prizes and final figures regarding charity money raised will be published as soon as they are finalised. As your newsletter editor, I can only congratulate all my colleagues who have made this happen through hard work, enthusiasm and commitment. And for supporting me when the media came calling.... it has been a pleasure and a delight. 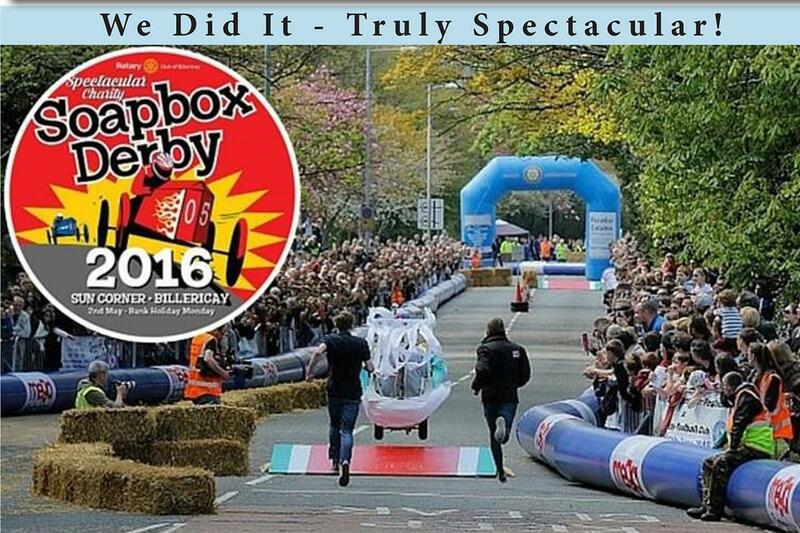 This Page contains links to all the newsletters published about the 2016 Soapbox Derby.